The research is clear--better empathetic communication and engagement with injured workers can reduce workers' compensation costs associated with their recovery. HR and EAPs should collaborate on this construct to get employees back to work sooner, reduce lawsuits, help prevent related employment claims, identify more troubled employees at risk of re-injury, and address secondary personal problems of injured workers that sabotage recovery. This is not rocket science. Get excited, man! Follow 25 injured workers in 2018 and engage them in an "EAP Proactive Recovery Program." 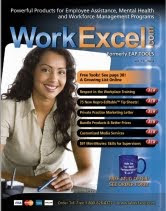 Then, compare your results--using 6-8 metrics--absences, treatment costs, re-injury rates, legal claims, reduced HR hassle time, speedier return to work, employee turnover, reduced overtime, etc.--to the same costs associated with the last 25 compensable injuries that were not similarly followed. You should see a powerful return on this program. Then show up at an EAPA conference or share your results at a SHRM conference. Even better, attend a insurance or risk managers conference and promote employee assistance programs for the management tools they actually are, and should be, to help more workers and reduce costs. You might spark a needed true-to-the-spirit Core Technology EAP renaissance. 1. Consider having injured workers engage with the EAP. A self-referral, or even a formal referral after injury is appropriate because the referral is based upon a job-related issue--injury. Another source of referral for such a program is the workers' compensation managed care nurse--get this individual on board with the program. 2. Have the EAP assess the psycho/social and environmental issues, and intervene with those that could contribute to a prolonged absence. This is a research-proven cost driver for WC injuries--the longer out, the less likely the return to work. 3. Institute EAP follow-up with medical doctors. They often have information helpful to a better EAP assessment. 5. Provide assertiveness training to help injured employees avoid peer pressure to engage in prohibited work activities that can cause re-injury when they return to the job. 6. Conduct an EAP assessment for untreated alcoholism. (WC injuries are three times higher for alcoholic workers.) Also have the EAP discuss opioid use issues because many of these folks are at risk for addiction, especially those with back injuries. So, "who you gonna call" to reduce workers' compensation costs? Try an effective EAP with a programmatic approach to WC injury and recovery--or get one in place for 2018. 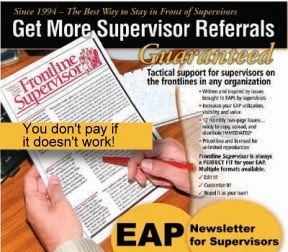 Increase your supervisors referrals free for the next three months, no catch. No invoice, No Bill, no hassle, no nothin'. - Fax this form, and cross out the price on it. And mark "Give it to me free, Dan." 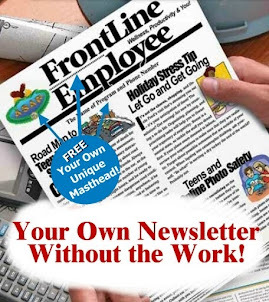 Put your email on the form. I don't need your name.